Check back here soon for what’s next! The Attorney General’s office recommended last week that the state Department of Public Utilities (DPU) not support the secret contract between National Grid and the developers of One Dalton. This is a sweetheart financing deal that would have benefited a wealthy group of developers, leaving the general ratepayers on the hook for the pipeline being installed. To protest the deal between Grid and the developer, BCEC will be rallying outside of the DPU offices at South Station this Friday, noon to 1 pm. Please join us if you can for a vigil of protest. Let us know you are coming by emailing BCEC@BostonCleanEnergyCoalition.org or by signing up via our Facebook page. 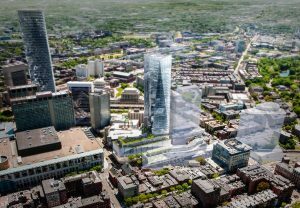 National Grid plans to build a one-mile intermediate-pressure pipeline in the Back Bay/South End to provide gas to new buildings that are currently under construction. The pipeline will start at Berkeley Street in the South End and end on Belvidere Street in the Back Bay. 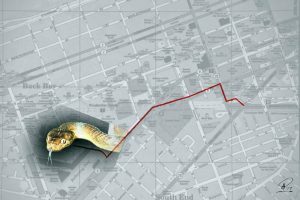 To date there has been limited public input regarding this pipeline, in spite of multiple requests by BCEC for a more robust public process before the City approved this new fossil-fuel infrastructure. 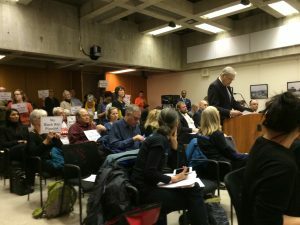 In response to growing opposition to this pipeline, this public meeting is being held by the City of Boston’s Office of Neighborhood Services and is co-sponsored by the Neighborhood Association of the Back Bay (NABB) in order to have National Grid answer questions from NABB, BCEC, and interested residents. Sought are further details about the project, facts about the pipeline’s necessity and worthiness, and information as to how the City reconciles the effect more gas infrastructure will have on climate change and our carbon footprint with the City’s efforts to reach carbon neutrality by 2050. For most cities, including Boston, buildings are the largest cause of carbon emissions. Please attend this important hearing in support of testimony from building/development/academic experts on net zero, advocates for a carbon-free Boston, and members of the administration about why we must address how we plan to fuel the 70 million square feet of new development planned for the city. If we just move forward with the natural gas as currently slated, we will destroy any hope we have of meeting the Mayor’s stated goal of being carbon neutral by 2050. Use of fossil fuels needs to be curtailed, and our buildings must instead focus on employing renewable energy. Please consider stating why you support this effort to move to NZ carbon during the public testimony portion of the hearing; everyone is welcome to speak for two minutes; sign up when you arrive at the hearing. Background: During the Boston City Council meeting on August 2, Councilor Matt O’Malley, Chair of the Council’s Environment and Sustainability Committee, introduced an order calling for a hearing to consider the benefits of developing net-zero-carbon requirements and incentives for future construction in Boston. All 12 of his fellow City Councilors spoke up in support by co-sponsoring the order. BCEC worked with Councilor O’Malley’s office to propose this effort and will partner with him and the City Council to bring this strategic plan to fruition. One proposed route for the new pipeline snaking into downtown. National Grid has proposed to construct a mile-long fracked gas pipeline though the Back Bay and South End to service new buildings. 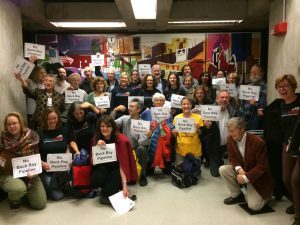 Join us in opposing the pipeline by attending the next public hearing being held by the City of Boston’s Public Improvement Commission (PIC) on Thursday, Dec. 7, at 10 am in Room 801 of City Hall. The PIC will discuss granting approval for construction of the pipeline. We need to pack the room, so spread the word! National Grid has proposed to construct a mile-long fracked gas pipeline though the Back Bay and South End to service new buildings. 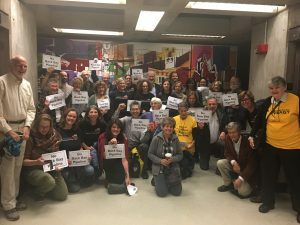 Join us in opposing the pipeline by attending the next public hearing being held by the City of Boston’s Public Improvement Commission (PIC) on Thursday, November 2, at 10 am in Room 801 of City Hall. The PIC will discuss granting approval for construction of the pipeline. We need to pack the room, so spread the word! Editor’s Note: We packed the room and received another two-week delay! Dress in your scariest zombie attire and meet by the front entrance of the Back Bay station at 7:45AM on Tuesday, October 31. Extra masks and props will be provided for those who need to borrow. Between 8 and 9 am we will hand out flyers about the pipeline along with pieces of candy to passersby. Goal? Spread awareness about National Grid’s plans to build a Back Bay/South End pipeline and to get people to take action by attending the next PIC hearing (10 am on Nov. 2; see next event listing) to oppose approval. Project Description: The Proposed Project consists of a single condominium tower containing up to approximately 108 condominium units, rising from a Podium base containing approximately 45,500 square feet of first and second-story retail and restaurant space fronting on Dalton, Boylston and St. Cecilia Streets, a two-story above-grade parking garage containing approximately 175 spaces, and an amenities floor. A greenspace and outdoor amenity area for the condominium unit owners will be located on the roof level of the Podium. The second residential building proposed in the PNF has been eliminated resulting in reduced potential environmental impacts. Prior planning for this project can be viewed at tinyurl.com/Parcels12-15. BCEC is concerned about the foreseeable growth in the use of natural gas to meet the needs of the new buildings already approved and under review in Boston, which is inconsistent with the City’s climate change targets to significantly reduce greenhouse gas emissions over the next 10 to 30 years. As the recent resolution passed by the City Council calls for, careful deliberation is required to develop solutions that enable a transition to much lower and ultimately zero reliance on fossil fuels in buildings, and do not lock the City into long lived investments in additional natural gas infrastructure and equipment that will make these targets unattainable. Attend this meeting and/or send comments by November 6 to the BPDA about this project. 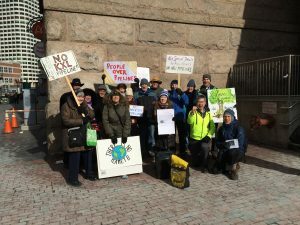 The Public Improvement Commission (PIC) will consider approval of National Grid’s petition to begin construction of an intermediate fracked gas pipeline that will run 1.1 miles through the Back Bay and South End. Members of the public are able to testify. BCEC members and supporters will be expressing our opposition to a project that represents a significant expansion of fossil-fuel infrastructure whose sole purpose is to power luxury high-rise structures. We need to be building 21st century, state-of-the-art, efficient new buildings as we convert to 100% renewable power sources. Come lift your voice. Please wear a green shirt!